Your maximum hand size is reduced by three. 10/1/2009 If multiple effects modify your hand size, apply them in timestamp order. 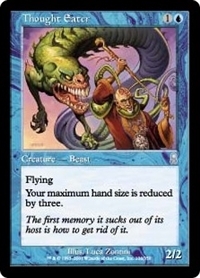 For example, if you are affected by Cursed Rack (an artifact that sets a player’s maximum hand size to four) and then put Thought Eater onto the battlefield, your maximum hand size would be one. However, if those permanents entered the battlefield in the opposite order, your maximum hand size would be four.